I challenged myself to test out an idea for a informational site on a technical thing, Electron, that tried to be as concise and plainly worded as I could get it. So here's Essential Electron, something I'll keep tweaking! Technical documentation can be long, jargon-heavy and hard to know where to begin with. I think having detailed documentation is good in general, but I felt there was a place for something simpler and took you from top to bottom on the topic in one go. Main section should be 2-3 sentences. Jargon replaced with expanded phrasing. Links for more information provided in each section. I wanted to take people through the flow of learning what Electron is, what development is like and how to get started, while remaining high-level. 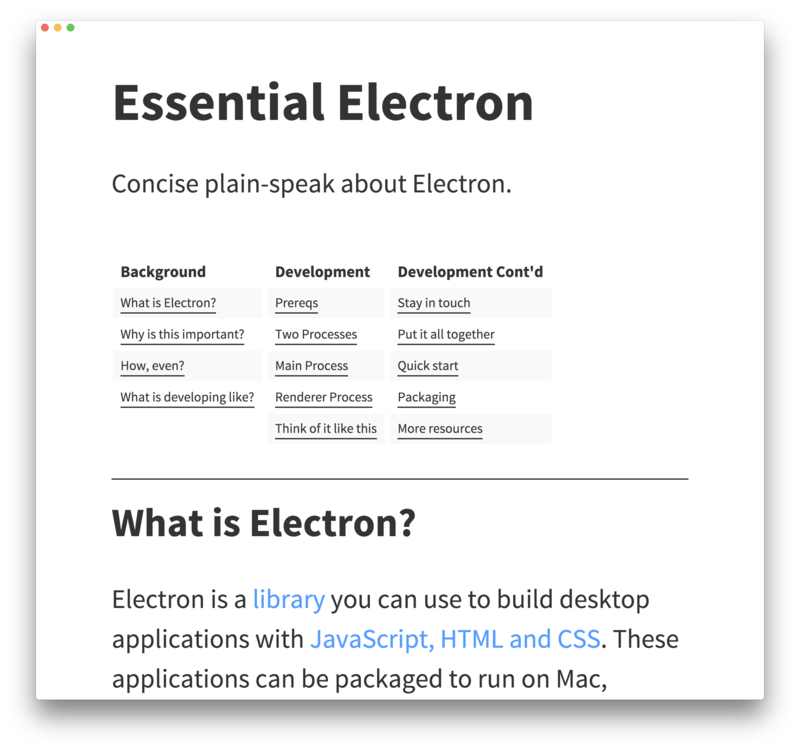 Someone should be able to go through each of the sections and only read the large text and still get a good sense of what Electron is. If a word or concept is new they can check the definitions. If a particular section is of interest they can use the resources to get more information. I pulled and tweaked some graphics from a previous workshop I'd done to help illustrate this points. I'm pretty happy with the experiment though I have some more ideas and will keep refining this. Hope it turns out useful to some! Jessica Lord is an open web developer, designer and urbanist in Portland.